Opinions seem differ on this, but I found that string color can significantly affect string performance. 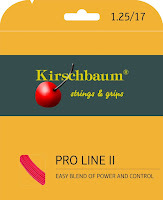 For example, the Kirschbaum Pro Line 2 feels nice and plush in red, but pretty stiff in black. So how about the Völkl Cyclone, one of the most popular polys out there, and (again) my current string of choice? In general, the Cyclone has been considered a great half-priced alternative to the (overpriced?) Babolat RPM Blast. 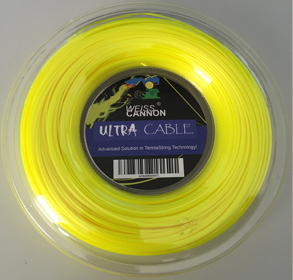 You probably came across this post since you appreciate its spin to price ratio, while being pretty well rounded otherwise as well (as opposed to the spin chart topping Ultra Cable, for example). Ironically, despite making a gear shaped string, that's been on the market for years, while most players have been looking for spin strings... Volkl is still not saying anything in regards to spin on the packaging! The Cyclone is still available in black, yellow, and orange. Serious players would probably choose by playing characteristics, but then there's also aesthetics, and price. Between the different colors, I found that prices can differ up to about 30%. So for example, should one just buy the cheapest one? Gauge: 1.25mm / 17, which has always been my top choice. Black Cyclone - Surprisingly the softest of the bunch. Playing-feel-wise, it's probably the most similar to the RPM Blast, even though the Blast is much stiffer. Does not snap back as loudly as the other 2. Seemed like the most powerful too. Yellow Cyclone - To me, the most generic feeling - I remember nothing really stood out to me. When I tested, it seemed to sit right between the comfort and power of the black and the spin of the orange Cyclone. If you want an allrounder, this might be worth a try. Orange Cyclone - Most audible snapback, suggesting it's the most spin friendly, and feels like it to. Still appears somewhat plasticky to me, maybe the least powerful of the 3. Combined, that makes it the most predictable, which is why I stuck with orange for a while (and came back to it in 2018 after playing the Hyper-G for a couple of seasons). Compared to some of the competition, I'd say less spin but more power and comfort than the Tour Bite, a bit more spin but less pop and worse long-time playability compared to the Hyper-G, and softer playing than the black Moto and certainly the Black Widow. Finally, quick note that a review and comparison of the V-Torque, V-Torque Tour, and V-Star is next on the list, probably happening sometime later this summer (2018). Also, I had already tried the Cyclone Tour a few times, and found it softer, less spinny, but mostly sucking a bunch of power on impact! More regarding other stings in this comparison. 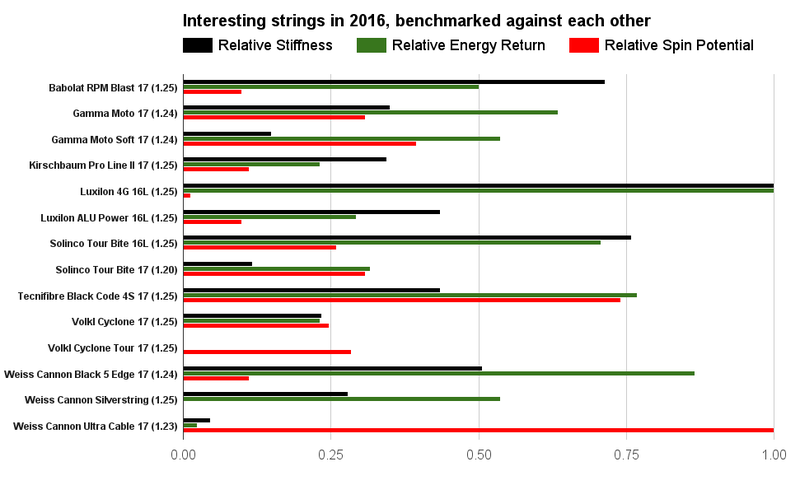 Well, first I thought this post should be titled "my top 3 strings *of* 2015". But turns out that my favorite strings have come out before 2015, and what really matters is what works best at any given time. Hence my top 3 string *in* 2015. Over the last few years, a seemingly endless stream of polys have been hitting the market. On the one hand that's quite exciting: many new strings to - literally - play with, and there's always hope to find a game changer amongst them. On the other hand, which ones to try? If you look at Tennis-Warehouse for example, you'll find over 300 single sets of poly. Other shops offer house, budget, and/or lesser-known-brands as well. So how to navigate that market? Personally, I keep an eye out for announcements and reviews. I also check out the "string of the year" surveys, which usually bring 1-2 strings to my attention. From time to time, I search for "best string of 2015", "best poly", "best tennis string" etc. And finally, talking to other tennis folks at tournaments tends to yield some interesting insights too. I then try the strings that seem promising and/or interesting. Over the last few years, that led to testing north of 200 string setups, so thought I'd share my 3 favorite to date. What have I been looking for? Most importantly, I wouldn't want to sacrifice on performance. So spin, power, and feel are equally important to me. I don't care too much about durability in the sense of the string breaking. For years now, I've been cutting out polys long before they would have broken. Obviously a drastic change in playing characteristics, e.g. due to tension loss, would not be great. If a string can give me 5 great, consistent hits, I'm happy. Also, I definitely want poly. I've been playing polys for more than 25 years now, starting with the good old PolyStar Classic, and sticking to it for more than a decade. I've never really found a multi setup that delivered all that power and feel that many are raving about. Plus lack of spin would be an issue. In terms of gauge, I like strings around 1.25 mm, maybe +/- 2 mm. I haven't been getting a solid enough feel with thinner gauges, and not enough finesse out of strings once they get close to 1.30 mm. I found this one by accident. As apposed to many other tennis friends, I had never been fond of Kirschbaum strings. They all used to feel pretty dead to me. But then I found some good reviews on the Pro Line II and decided to gave it a try. Out of the box, the string is soft as licorice. So that was fun and made it easy to string. On court, that translated to comfort, power, and feel. If strung too tightly though, the string can quickly become generic. I would probably shoot for a string bed tension around 22 kg / 48 lbs. For the first while I was very excited about the Pro Line II, and even strung up a bunch of older racquets with it. After some time I found one key issue though - it just wouldn't grab the ball. No big surprise - it's soft and round with a low friction surface. I mostly noticed that on second serves, which would tend to sail about a foot long. Also, the string seems very sensitive to temperature. In heat, balls would just fly. Overall though, if you'd like an awesome playing string, don't care much about a string's spin potential, and play in constant conditions, this might be a good choice for you. Also, due to its high comfort level it's probably one of the best strings for teaching. Note that I found the black version to play noticeably stiffer. In many reviews over the last few years, the Tour Bite came out as the front runner in regards to spin potential. I felt the same - most bite I've ever put on the ball. That's not only great for ground strokes, but also very effective for drop shots, opening up angles, and creative shots like sidespin backhands. Again though, when strong too tightly, the Tour Bite loses some of its qualities. You still get decent spin, but lose most power and ball pocketing. It also becomes very hard on the arm. I found it to be one of the stiffest playing strings out there. 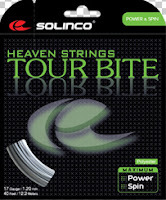 Solinco noticed that too and put out "Tour Bite Soft", which I tried too but didn't like as much. So I'd go for the original Tour Bite, and string it quite softly (and slowly), maybe iterating from the low 20s (kg) / mid 40s (lbs). I found that a dampener helps too. I usually prefer playing without one, but with the Tour Bite I put a thick one in. That changes the feel from metallic to somewhat plush (!). In addition, a cushy grip and of course a forgiving frame can further help to take the uncomfortable edge off. The best term to describe the Tour Bite might be "effective". It produces a heavy ball with massive spin. That not only creates problems for your opponent, but also keeps your shots in the court. If you play a lot and/or mishit a bunch and/or string too tightly, your arm will probably start to complain. In that case you might want to string up a more comfortable alternative while you recover :) Or try a hybrid - Ana for example pairs the Tour Bite 1.3 with a Wilson Natural Gut. In any case, great string to try and benchmark against. UPDATE: I tried the Tour Bite in different gauges, which are all significantly softer - read about it here. This summer, I did string up the Tour Bite too tightly and ended up with a sore arm. That led me back to looking for something between the Tour Bite and the Pro Line II. 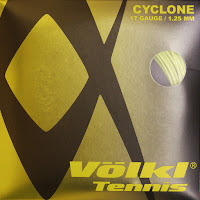 I remembered the Völkl Cyclone, which many have found to be a great half-priced alternative to the Babolat RPM Blast. I had tried the black Cyclone on a demo racquet, and it felt a tad too stiff for me. I hence tried the orange one, and ended up really liking it. There's also a yellow version - if you want to dive in, you can find my comparison of the 3 colors here. The slightly more expensive Cyclone Tour is not bad either - it plays noticeably softer, but I found that it eats up too much power on impact. The ball just seemed to lose more and more momentum as it approached the opposite baseline. So the orange Cyclone is my current string of choice. It's a solid (though not perfect) combo of the red Pro Line II and the Tour Bite. Indoors, I found that it plays best around a string bed tension of 22 kg. Outdoors I'm currently shooting for 20.5 kg, depending on conditions, balls etc. If you decide to play test any or all of these, I'm sure you'll gain some valuable insights! The Babolat RPM Blast is pretty stiff, gives back a decent amount of energy, but doesn't do its name justice in terms of spin potential. Might be due for an update after almost 4 years on the market? 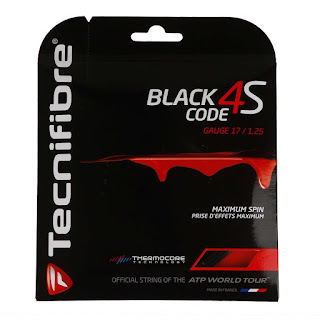 The Tecnifibre Black Code 4S looks like a great all-round string on paper. I liked the original Black Code back in 2009. There's a short-term review here - felt pretty stiff, and gave me decent but not crazy spin. Tour Bite and Cyclone still seem grippier to me. The Gamma Motos have received great reviews, which the numbers here seem to validate. In my tests, I haven't been able to dial in the tension yet. They seemed to lack power - when strung somewhat tightly they were all about control, and when strung somewhat loosely it was tough to get shots past the service line. Will give each Moto another shot though. Solinco's Tour Bite appears to be noticeable softer in 1.20 than in 1.25, and should deliver a tad more spin too. I've played the 1.25 for a while but ended up finding it too firm in my RF 97 - so the 1.20 might be an alternative after all. UPDATE: comparison here. The Völkl Cyclone looks like a great all-around string and still plays like one. My subjective findings regarding the Cyclone Tour are confirmed in the numbers: it felt very comfortable, but swallowing most of my built-up momentum on impact. The spin rating seems off - it definitely did not appear more spin-friendly to me than the standard Cyclone or the Tour Bite. I've played Kirschbaum's red Pro Line II for a while, and found that color to be as soft as licorice (vs. the black one). So assuming Tennis Warehouse measured the black one here, ending up with a relatively high stiffness measure. Both definitely lack a bit of ball bite for me, for example causing my second serve to sail just a bit long. Loved a loosely strung Silverstring to counter the stiffness of the Wilson BLX Tour 90 for a while, but was also looking for a bit more more ball grab there. In this group, it marks the low end of the spin spectrum, it however is relatively soft and bouncy. Now I'm quite excited about experimenting with the Black 5 Edge, which should also provide a good bit more power. The classic Luxilon Alu Power is still somewhat low powered, paired with a low spin rating. It might still be an option if you hit out hard and flat like DelPo, and see your string as a tool to keep your shots in the court. So that's a bit of an overview for you. Personally, I'll stick with the orange Cyclone for match play, while experimenting with the Black 5 Edge, the Moto Soft, and the Black Code 4S in practice. Thanks again to TW for publishing their string performance database. I again chose a reference tension of 51 lbs. You can find definitions of the properties here. I remember at first, I didn't believe the hype. Supposedly Andre Agassi, Steffi Graf, and active pros like Sam Querrey, Donald Young were quite excited about the Hyper-G and were using it voluntarily. Initially, when I tried the string short after its launch, it felt like a mixture of muted and plasticky. After a few more tries later on I started getting used to it, and gave it a go at a clay court season prep tournament. Despite slow, uncomfortable conditions (wet, cold, windy), the string produced good pop and pretty sound all-around results. Switching back and forth with the Tour Bite for a while, it was apparent that the Hyper-G by couldn't get close to the Bite's grab on the ball, but was much more powerful. Over the years, I've tried stringing up the Tour Bite very loosely to make up for its lack of power, but always felt I had trouble getting the ball through the court. Compared to the average string, the Hyper-G can produce a good amount of spin, so that ended up being the compromise for the last year. The biggest positive surprise came when I picked up Hyper-G racquets that I hadn't used for months. They still played very nicely, subjectively sometimes even better than fresher string jobs. So while I cut out any other poly after 5 hits max, the Hyper-G can probably stay in twice as long. If you don't play as much and/or are not as picky, you might be happy getting it restrung once per season (so 4 times a year). Bottom line, the Hyper-G is still in my top 3, along with the Cyclone and the Tour Bite. At the end, the orange Cyclone still wins for me since it grabs the ball better. When it comes to matchplay, you trade that off with a quickly degrading life span, both in terms of tension and ball grab. So after 2 competitive matches, it's due for a match-day restring. How to think about price? Well, depending on the market, there seems to be a ~20 - ~50% premium compared to the Cyclone or comparable strings like the Gamma Moto. Its priced similarly to comparable Tecnifibre strings and the oldie (and for some goldie) RPM Blast... unless you're e.g. in the US. If you intend to keep the Hyper-G in your racquet for a while, your "cost per decent-feeling hit" might come out cheaper than most of the competition. For more thoughts around strings, click the "string" label below. You can also dive into my string jobs over the last ~10 years, including ratings and impressions, here. Stringing: String feels quite soft, not as edgy as the Dunlop Black Widow, somewhat similar to the WEISSCannon Black5Edge, not as soft as the red Kirschbaum Pro Line II. Playing: Stiffer than expected after the stringing experience. String did settle in after a couple of weeks on the racquet, making it a bit softer. Good ball grip, but not too crazy. Subjectively less spin production than the Tour Bite or Cyclone, but more than the RPM Blast. Personal takeaway: In the current setup still too stiff for me. Will stick with the orange Cyclone for now, and might give the 4S another try @ 20/19 kgs sometime. General recommendation: Might do well in a powerful frame, such as the Babolat Pure Drive or the Yonex Ai or DR series, strung in the low 20 kgs / high 40 lbs. A dampener should take some of that stiffness away. Do note that you pay a ~50% premium over the Cyclone, which may be offset to some extend by better tension maintenance. After about half a year of playing and North of 100,000 ball contacts with the RF, it's probably a good time to post an in-depth review. Remember that Wilson has been stating that the racquet was co-developed with Roger, and that he is actually playing with what you can buy. So here's your chance to feel like Roger, at least a little :) So how does his racquet feel, actually? Most notably, head size and beam width have increased, mostly resulting in more power (and less backhand shanks for Roger :P). It probably makes most sense to compare the RF97 and the SixOne 95 a bit more, as those 2 are the most recent racquets in the lineup. The RF97 is even a bit heavier, by ~7 grams. There are only a handful of racquets in that weight range on the market, however for both racquets the official head light balance leads to a manageable swing weight. The RF97s racquet head is a bit wider and starts a bit lower in the throat. Compared to the 16x18 SixOne 95 you get 1 extra cross string. I can't help but think I would have preferred a 16x18 bed, but hard to tell without trying it out... The string spacing is pretty even around the sweet spot, which I do like as it helps with both power and spin. I currently don't have a precise enough measurement tool at hand, but by placing both beams side by side they *seem* almost identical in width, at around 21.5 mm. These days that's a good compromise between feel and power. If you hit with Roger's previous racquet, the Tour 90, or the current 95S, you'll appreciate the speedy feel and precision of an 18 mm frame, but you'll likely find that it's tough to hit the ball through the court. With current Wilson frames, I'm right between grip sizes 2 and 3 (4 1/4 and 4 3/8). I changed my set of grip size 3 RFs to size ~2.5 by replacing the leather grip with the Babolat Skin Feel. That took ~10 grams off the frame and moved the balance point by ~6 mm towards the head, making it now a tad lighter but also a tad less head light than my SixOne 95. Overall still in very close range. Warning: Wilson's generous manufacturing tolerances lead to very different racquets carrying the same name. In addition to the weight / balance / swing weight issues, I now found that 2 of my 6 frames are actually ~0.4 cm shorter (!). Never seen or heard of that before, so it didn't even occur for me to order and check for length. So ask for what you want and measure what you get. More info here. The mass and relatively open string pattern help produce a heavy, decently spinny ball. If you end up with a frame with higher swing weight than the official spec, your shots will get even heavier, but it will also be tough to get the racquet around. If you end up with a lighter swing weight version, the RF transforms into more of a serve and volley racquet. I found a true to spec frame to be a nice all-court racquet. I've had the pleasure (pain?) to hit with all 3 variants, and insisted on receiving the all-court spec that's printed on the frame. Product-design-wise, I am still somewhat bothered by the relatively low-sitting throat and racquet head, and the throat being a tad longer than the SixOne 95. I blame that combo for the sometimes wobbly response I receive on hits outside the sweet spot. Comparing the RF97 and SixOne 95 side by side, the 97 produces more spin and a higher launch angle, however the 95 is both noticeably more stable and more maneuverable. The SixOne's benefits become obvious when returning fast serves, and especially on volleys. If I was exclusively playing serve and volley, I'd stick to the 95, still probably the best racquet on the planet for that purpose. However, the 97 better suits the modern baseline game while doing well enough on serves and volleys. Hence the RF97 is probably the better all-year, all-surface racquet. Both the RF97 and the SixOne 95 can feel a bit planky - I've had similar a similar impression hitting with the Babolat Pure Controls, or even the Yonex Ezone DR 98. And - as common amongst today's mass-produced frames - both feel quite stiff, making it hard on the arm to use stiffer strings. I'd love to pair the RF with the 1.25 Tour Bite, but even around 20 kg / 44 lbs I end up in pain after a while. I have a video hitting with the RF here, which you might have seen in another post on the stick. Player type: All-court players who have (or want to develop) refined long swings, want to feel some heft in their hand, and aim to produce a heavy ball. String: I've been playing the RF with the orange Cyclone 1.25, strung at 21/20 kgs in the summer, adding a few kgs in the winter. The 1.25 mm Tour Bite was a great fit too, but caused some arm pain. I would generally lean towards a softer but still grippy string. If money is no issue, Roger's Champion's Choice string job works nicely too. Despite the manufacturing tolerance issues and sometimes wobbly response, the RF97 Autograph turned out to be a really nice racquet. Subjectively I'd say it's still one of the 5 most interesting frames on the market. There's not much competition in that weight range, and despite the high gram count it's much more playable than you might think. If you have - or want to develop - smooth swings, and like the thought of producing a heavy ball with a good amount of spin, give it a go. Stringing: Tough! String is so edgy it would slip through the clamps (despite tightening), and at times even through the tension head. Also cut into the fingers a bit. The sharpness reminded me a bit of the Dunlop Black Widow, which however wouldn't slip, and seemed stiffer. Playing: Spin is pretty good, but not as extreme as the rating would suggest. It did feel like the string eats up a good amount of power on impact. That made it somewhat comfortable, but didn't allow me to hit a heavy ball. I switched back to racquets strung with the Tour Bite and the Cyclone for comparison, and found both strings to deliver more power, provide more solid feedback, and produce a similar amount of spin. Personal takeaway: Switching to the Ultra Cable would sacrifice too much power without overcompensating that with additional spin. Wouldn't enjoy stringing it frequently either. Will stick with the orange Cyclone for now. 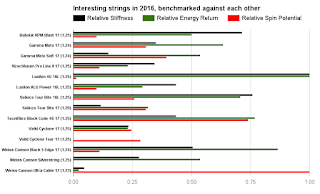 Too see how this string performs in context, check out my comparison of interesting strings in 2016.